The American Cancer Society estimated that cancer of the thyroid causes 53,990 new cases and about 2060 deaths in 2018. The chance of being diagnosed with thyroid cancer has risen and this increment seems to be the result of increased use of ultrasound, CT and MR imaging examinations for reasons unrelated to the thyroid. Up to 50% of adults in central Europe have one or multiple thyroid nodules. However, the prevalence of latent carcinoma in an unselected autopsy study was 8.6%. The main diagnostic task is to differentiate between benign and malignant lesions, preferably based upon on ultrasound parameters or scoring systems like TI-RADS. Although there are no pathognomonic features for malignant thyroid nodules at ultrasonography or any other imaging modality, sonography of the thyroid gland has beyond doubt become the imaging method of choice for the last three decades, combined with FNA in suspicious cases. Several technological improvements like ultrasound elastography, and a proliferating literature of different scoring systems allow the conclusion that ultrasound is an important gatekeeper for further diagnostic steps but not capable, so far, to identify autonomy or malignancy with a sufficiently high accuracy. This article is part of the Topical collection on Oncologic Imaging. Anton Staudenherz and Thomas Leitha each declare no potential conflicts of interest. Global iodine nutrition scorecard. 2014. http://www.ign.org/cm_data/Scorecard_IGN_website_02_03_2015.pdf. Accessed 16 Feb 2019. British Thyroid Association, Royal College of Physicians. British thyroid association guidelines for the management of thyroid cancer. 2. 2007. https://onlinelibrary.wiley.com/doi/pdf/10.1111/cen.12515. Choosing Wisely SNMMI. http://www.snmmi.org/ClinicalPractice/content.aspx?ItemNumber=9914. Accessed 15 Feb 2019. ••Rago T, Cantisani V, Ianni F, Chiovato L, Garberoglio R, Durante C, Frasoldati A, Spiezia S, Farina R, Vallone G, Pontecorvi A, Vitti P. Thyroid ultrasonography reporting: consensus of Italian Thyroid Association (AIT), Italian Society of Endocrinology (SIE), Italian Society of Ultrasonography in Medicine and Biology (SIUMB) and Ultrasound chapter of Italian Society of Medical Radiology (SIRM). J Endocrinol Invest. 2018;41(12):1435–1443. https://doi.org/10.1007/s40618-018-0935-8. This study addresses a fundamental problem, namely the fluctuation of the reproducibility due to the different operator experience as well as the different device settings. Quality can only be achieved by standardizing the settings and in particular the unification of terminology. A simple risk stratification for thyroid nodules in conjunction with the risk of malignancy would lead to reasonable clinical results. However, the key to optimal diagnosis and reporting leads through an agreement in the diversified nationally and internationally societies. National Comprehensive Cancer Network. https://www.nccn.org/professionals/physician_gls/pdf/thyroid.pdf. Accessed 14 Aug 2015. •Migda B, Migda M, Migda AN, Bierca J, Slowinska-Srzednicka J, Jakubowski W, Slapa RZ. 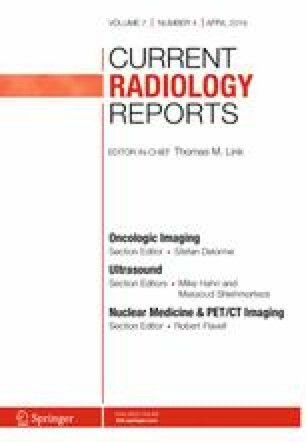 Evaluation of four variants of the thyroid imaging reporting and data system (TIRADS) classification in patients with multinodular goitre—initial study. Endokrynologia Polska 2018; 69(2); 156–162 https://doi.org/10.5603/ep.a2018.0012. The paper compares several scoring systems for the sonographic finding in Thyroid lesions. The differences are analyzed and discussed on the basis of real patients with multinodular goiter. Whether one of the TI-RADS classifications will become adopted in the daily routine remains open. Previous systems had a high negative predictive value but mostly in subgroups and thus it remains to be shown which of the newer scoring systems will prove themselves in reality.